" Wildwood by the Sea - New Jersey - 1965." 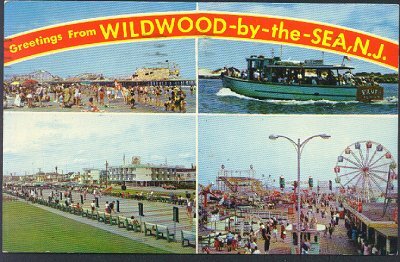 (1506) POSTCARD: Wildwood by the Sea - New Jersey - 1965. -Condition: Very Good.- Posted. Colored photo of different views. Includes Hunt's Pier. Shows Party Boat, Marine Pier, Shuffleboard Courts and Rio Motel. Also a handwritten message. Card was sent to Mrs. Wm. Lentz in Harrisburg PA. Price: $3.00 + shipping.